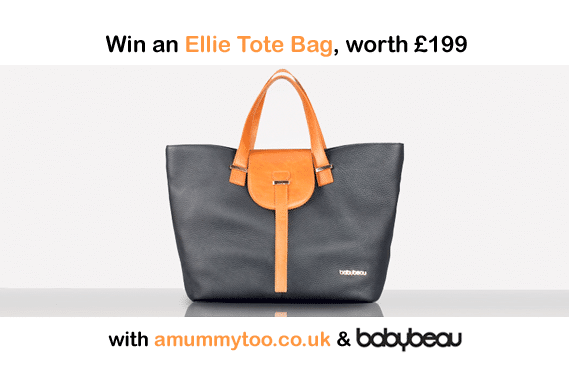 I am very excited to be bringing you the opportunity to win the Ellie Black Stylish Shopper Tote from BabyBeau. Ellie is a spacious, versatile changing bag made from luxurious two tone supple wrinkled leather. It’s light, glamorous, wipes clean and comes in colours that go with just about anything, making it a perfect everyday bag for busy mums. The main flap is secured with a button popper and it can be worn 3 ways – cross-body, handheld or shoulder tote. You can even clip it to your stroller. AND leave a comment below telling me that you’ve done it. The giveaway will close at 11.59pm UK time on 30th June 2013 and a winner will be selected at random. See the prize draw T&Cs. Product imagery via BabyBeau. BabyBeau is providing this prize. I have tweeted about the giveaway @PiscesCate. Fingers crossed! tweeted – what a beautiful bag. just tweeted about this comp. what a lovely bag it is!! thank you for the chance to win it. Thanks for a fabulous prize, I am a huge handbag lover so got excited at this! I have tweeted as @jessups just tried to put the tweet information but it won’t allow me to post comment! Like ‘BabyBeau’ on Facebook as Alexandra McGahey. Already like ‘A Mummy Too’ on Facebook as Alexandra McGahey. Hi liked, sheared and followed because I love that bag! I love it. not only is it stylish but practical too and will enhance any outfit be it day time or evening wear. Have Subscribe by email to the BabyBeau newsletter! Have subscribed by email to A Mummy Too Blog! Have liked BabyBeau on Facebook! Have liked A Mummy Too on Facebook! I have tweeted about this. It looks lovely. Tweeted, and liked on facebook! What a fab competition. This will make amazing arm candy! Have tweeted. I have done all 7 actions :) best of luck everyone! Subscribed by email to the BabyBeau newsletter! Liked A Mummy Too on Facebook! Hi, I like A mummy too on facebook. I’ve entered this comp and followed liked everything for my friend Debra who is expecting in August. Thanks! I’ve entered the Baby beau comp! Fingers crossed I win! Following @AMummyToo on Twitter great prize! such a good job I saw your tweet! I was just about o spend £260 on a Michael Kors bag! I’ll wait & see if I’m lucky enough to win this one , but if I’m not, I’m pretty sure I’ll be buying this & not the Kors! Subscribe by email to the A Mummy Too blog – done! Follow @BabyBeau_UK on Twitter – done! Like A Mummy Too on Facebook done! I have liked all on Facebook and Twitter and also tweeted about the comp :) Amazing prize! Have tweeted! Would live to win my change bag got stolen! Can you believe it! I absolutely love the bag! I have followed both on facebook and twitter and subscribed to both emails. Not with Facebook – sorry! I have subscribed to your blog by email. I have tweeted about the babybeau competition !! I have tweeted and left a comment to win this super duper bag! Tweeted :-) Love this bag and would love to win one! tweeted the comp. lets hope i win. lovely prize would be very proud to own this! Judt Tweeted the competition and already following both Twitter accounts. I have been on Twitter and tweeted about the competition (my user name is @Loreleigh); fingers crossed for a little bit of luck to come my way now, especially with such a desirable prize. I’ve tweeted about the Ellie tote Bag. Absolutely love it. Very excited to be expecting my first. I have tweeted about this competition. I’ve tweeted (@leila_jo_mummy) – very nice prize! never mind the baby – this would be all for me! Lovely! wasfield has Retweeted the competition, just keeping fingers crossed now that I win !!! !